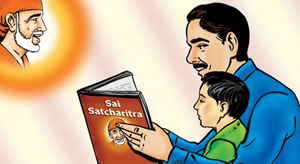 When life of Sai Baba is being discussed, prime literature which comes to our mind is 'Shri Sai Satcharitra'. Though Sai Baba lived on alms and possessed nothing in the name of property, He left a great treasure for us in the form of ' Shri Sai Satcharitra '. At the divine wish, Shri Hemadpant (Govindrao R. Dabholkar) was given Holy task of noting Sai Baba's supernatural deeds. Though considered as 'Biography' it is more of an 'Autobiography' written by Sai Baba Himself. He kept His boon bestowing Hand on Hemadpant's head and said, "Let him make a collection of stories and experiences, keep notes and memos. I will help him. But he should get rid of his ego, place (or surrender) it at My feet. He who acts like this in life, him I help the most. He is only an outward instrument. I should write My Autobiography Myself and satisfy wishes of My devotees. I shall Myself enter into him and shall Myself write My own life. Hearing My stories and teachings will create faith in devotees' hearts and they will easily get self-realization and bliss". Baba used to say, "Come to Me and I will give you what you want, so that you can take what I want to give you". Baba has never given any hard and fast rule and every point herewith under subsequent headings, is free from any strict practice. Its upto readers discretion and may follow whatever is acceptable to him/her and whatever their inner conscious demand and what their best judgement calls for. Any modification, suggestion are welcomed to throw more light on this subject matter. 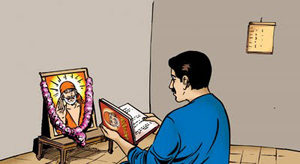 Being Holy Sacred text, Shri Sai Satcharitra is advised to be kept in clean and tidy place. The best way which i suggest and follow is to keep it in shrine of your home, so that alongwith worship of Baba and other Gods, this sacred text can also be worshiped as Holy like Ramayana, Bhagwad Gita, Bible, Kuran, Guru Granth Sahib. No matter which place you choose it is highly recommended to wrap it preferably in red, orange or yellow cloth. Students can keep it in their book shelves to increase their grasping power and make practice to read daily atleast one line. It can be kept at your work place too to benefit yourself and surroundings. Please note that, we must respect this Holy book and try to read daily and implement all the teachings in our life. In a nutshell, we must start living Sai Satcharitra. 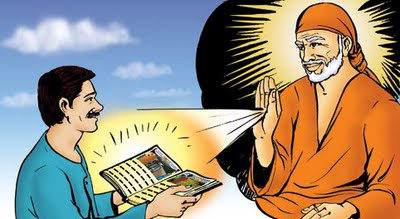 How to read Sacred text - Shri Sai Satcharitra? 1. Reading of this sacred text produces desired results, so it is recommended to surrender all disturbances, ego, physical or mental affiliations at Sai Baba's feet and then start reading. 2. All senses must be directed to the reading so the reading produces long lasting effects on your mind and heart. 3. Although no specific seat or posture is recommended sacred text - Shri Sai Satcharitra can be read by sitting in shrine at your home or any Sai Baba temple as per convenience. 4. Sacred text - Shri Sai Satcharitra can be considered as Holy as Bhagwad Gita, Ramayan, Kuran, Guru Granth Sahib. So it is not desired to underline words or sentences or write their own names for recognition. 5. For sick and old persons, sacred text - Shri Sai Satcharitra can be read by sitting at any comfortable place. If sitting while reading is not possible then it can also be read by laying down. 6. Girls and women should not touch or read sacred text - Shri Sai Satcharitra while going through menses. 7. It should not be given to small children to avoid possibility of damage. 8. Care must be taken to safe guard sacred text - Shri Sai Satcharitra from dust and unclean things. 9. One parayan of 51 days is also beneficial. This can be done by reading one chapter of sacred text - Shri Sai Satcharitra per day. Also parayan of 7 days/Saptah can be done to get desired fruits. 10. If the above two points are not possible due to any reason at least one line or one paragraph must be read. It would be disrespect of sacred text - Shri Sai Satcharitra if it is kept in one corner of your home and never read. Daily reading of 11th and 15th chapter is recommended. Also it is advised to read sacred text - Shri Sai Satcharitra on Ramnavami, Gurupoornima, Gokul Ashtami and Dashera. How to do parayan of sacred text - Shri Sai Satcharitra? divine magical effects within and outside. Parayan/Saptah means reading of sacred text - Shri Sai Satcharitra continuously for one week and finishing it at the end of the week i.e. seventh day. 1. First of all the place where you wish to do parayan must be cleaned and made tidy. 2. Lamp must be lit in front of Sai Baba's idol or photograph. Lighting a lamp marks Sai Baba's presence. Also it is desirable to light incense stick (agarbatti) and/or dhoop, thus purifying the atmosphere. 3. 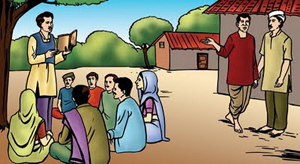 It is general practice that while doing any worship, devotee do not sit on floor directly. It is advised to first place a small mat or cloth on the floor to sit on it. The same applies here too. 4. It is upto devotee's discretion to offer any food as prasad. 6. After reading of each day (if devotee wishes) two coins can kept in Sai Baba's feet. Coins can be of any denomination, but they can be considered as "Shraddha" and "Saburi". At the end of parayan the amount thus gathered can be donated or kept in Sai temple's hundi (donation box) or prasad can be distributed which is purchased from the same money. 7. Every day's reading can be concluded by arti in the evening. If it is not possible then at least arti must be sung on last day. 8. If devotee wishes he/she can offer sweet dish or any desirable naivedhya to Sai Baba for all seven days. Otherwise naivedhya can be offered on last day of parayan. If this is not possible at least ready made sweets from market can be offered as prasad. Even if sugar or jaggery is offered as prasad, it will do. 9. It depends on devotee how he/she reads chapter allocated for each day. Chapters can be divided as per convenience. But every time you sit to read points 4 and 5 in this heading can be followed. Also lighting incense stick (agarbatti) and/or dhoop can be avoided. 10. It can be read out to sick or old devotees, if they are not in condition to sit by themselves and read. Also if it is read out before children and stories are explained to them in simple language, seeds of devotion can be sown in tender age only.